You didn’t buy some three-row, seven seat, softroading SUV for hauling around your kid’s soccer team. You bought a truck with a bed. And in your day, you’d just toss the whole soccer team back there anyway and head on down to the Dairy Queen for a post-tourney choco-dipped chocolate cone. But since that will get you arrested, imprisoned, and ostracized on Facebook for three seconds these days, that leaves your truck bed open to do truck bed things. But it can only do them so well. The truck bed leaves your cargo disorganized, exposed to the weather, and vulnerable to the damage that comes with flopping around on a metal truck bed, like that soccer team. We’ll help. Here are four of our very favorite bed mods for our 2015 Chevy Silverado 1500 LT Crew Cab with a 5.8 ft bed. Before you get punchy, remember that the part numbers may vary for your truck if yours is specced differently, especially the bed length. We know you know this, but we have to cover all the bases. If you’re not sure which Silverado truck bed accessories you need, give us a call at 877.787.8989 or drop your question in the comments section and our in-house, American techs will be happy to advise. A truck bed can be a dark place at night. Though most trucks come with work lights above the cabin, they’re rarely all the light you need, and you’re often stuck fumbling for the flashlight on your phone with your filthy, filthy hands. If you have a tonneau cover and you don’t want to roll it back, that cab-mounted work light is going to be useless. That’s why Access, who makes excellent tonneaus like the one we’re about to show you, came up with these awesome little LED lights for your truck bed. It’s a pretty simple machine, just a switch and a foot long strip of 18 LEDs ready to give you a clear view of your truck bed, the inside of your tool box, or wherever you want to stick it. Yes, it’s adhesive, so you can put it anywhere, though they’re generally found up under the bed rails. The lights are weatherproof, so they shrug off the environment with ease, and because they’re LEDs, they’re super bright, giving you a clear, cool view of what you’re working with. Each light comes with 3ft of wiring so you can tap into your truck’s power and you don’t need to worry about replacing batteries. The nearest wires run to your tail lights and your license plate lights, but add a little of your own wiring and you can hook them into the lines for your existing work light or even all the way up to your own battery, so you don’t have to have your headlights on while you work. As we said, the lights are especially helpful if you have a tonneau cover. 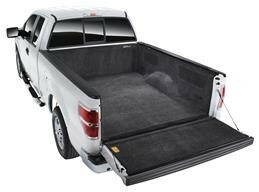 And you’ll be hard pressed to find a better Chevy Silverado truck bed cover for the money than this Access Lorado soft tonneau. It has a plethora of awesome features, but before we get into anything, maybe you’re a soft tonneau skeptic. “What’s the point of a soft tonneau when someone can just slash it and take your stuff?” you wonder aloud in a crowded elevator, eliciting stares from everyone in there. In fact, it may be tougher to get through the Lorado than some hard tonneaus. The Lorado uses ripstop, a unique form of fabric that incorporates super strong fibers into the weave, every 5-8mm. Ripstop is used to make things like military combat uniforms, the stuff firemen wear when rushing into burning buildings, and Brazillian Jiu Jitsu uniforms. It has been compared to Kevlar. No, it’s not impossible to get through, but for most, it’s probably not worth the effort. That might give you an idea of how tough it would be to tear through the Lorado with a loose piece of cargo. The advantage, of course, to a soft tonneau is that you can roll it up and get it completely out of the way. The fabric is UV protected and has been durability tested for temperatures from 40 below 0 all the way up to 110 degrees Fahrenheit. No stretching, no cracking. But if you do find your installation to be a little flappy or a bit too taut to latch, Access included these clever little adjustment knobs for tension, so you don’t have to reinstall the whole thing just to tighten it up. The cover latches with a beam at the tailgate, including a spring-loaded pull switch on the driver side and a manual sliding lock on the passenger side for extra security, and it’s so well designed that it requires no bows stretching across the bed of the truck. One less thing to get lost or damaged. Sides seal with a high-strength hook and loop system angled at 39 degrees to prevent rainwater runoff but still create a sleek, low profile look. Like all tonneaus from Access cover, it’s made right here in the States. Now you have lights and a roof. You could almost live in your truck bed. It’s okay to admit that you’ve thought about it. It’s certainly cheaper than property taxes, though we don’t have a toilet solution for you. What we do have is some carpeting for your truck-partment. Or maybe a mattress. BedRug has been disrupting the truck bed liner market for quite a while. People just aren’t installing the bulky, plastic tray-type bed liners anymore, because BedRug is just too good. The BedRug material has two layers of polyurethane, and they’re both nearly indestructible. The top, “fuzzy” layer is designed to provide extra grip to keep your cargo from sliding around. It’s antimicrobial and waterproof, so you can leave it out in the weather without having to worry about mildew or mold. Which is good, because mold is gross, like a certain presidential non-candidate’s toupee glue. It shrugs off chemicals like motor oil. When they were developing it, BedRug even tested this by soaking it in battery acid with no effect. It’s just tough. But it’s still soft enough to sleep on (if you want to take “truck bed” literally), or treat your cargo with care. Part of that softness also comes from the bottom layer, which is a thick, dense foam. The foam has been custom molded to fit the ridges in the floor of your exact truck bed so it won’t leave any voids or bubbles, and it won’t slide around. As you might guess, the foam also helps with impact resistance, so you don’t have to worry so much about breaking something if you drop it too hard into the bed. It’s even easy on your knees so you can climb around in there without having to see a specialist. The bottom has industrial hook and loop strips stitched into the foam, so whenever you need to pull the BedRug out and hose it down, it only takes a moment. This BedRug kit includes complete coverage, for the floor, sides, and inside of the tailgate. 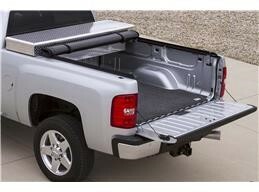 It installs quickly and easily and won’t interfere with your tonneau cover. One thing that might interfere with your tonneau is a tool box. These can be great if you’re a contractor, but for a personal truck with a tonneau, they get a little annoying. Some take up half the bed and you can barely find tonneaus short enough to fit in behind them. Others reside under the tonneau, but that means rolling back the whole tonneau every time you want to get to it. You probably don’t need that much space in a tool box, anyway. Undercover, another maker of tonneaus, came up with the perfect solution: the Swingcase. 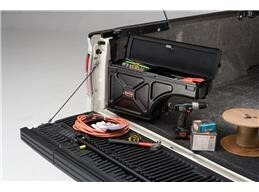 This unique tool box rides behind your truck’s wheel well and holds your stuff safely and securely. When you get to whatever you’re working on, you can just drop the tailgate, flip the latch, and swing the Swingcase toward you on a hinge like a door. The Swingcase is weatherproof and lockable, so no one will run off with your tools. It fits neatly under your tonneau cover and over your BedRug. “Which side is it for, though? Driver or passenger?” you scream loudly at a crowded park while a nearby policeman takes notice. It’s for both. Undercover custom built them not only to fit your truck specifically, but they have different part numbers for right and for left so you can rock a pair of them and hold all of your valuables. What if you want to take all of your tools inside or switch vehicles? The Swingcase, once swung out, can lift off of its hinges like a Jeep door, and you can carry it away. This is great for security, though the Swingcase also includes a padlock loop in the hinge so you can prevent it from being swung into the outer position and no one can lift it out. Because the case fills the space behind and above the wheel well, there’s a deep compartment for larger tools and a shallow one atop the wheel well for smaller ones. The swingcase is also perfect for your roadside emergency gear like jumper cables, fix-a-flat, tow straps, and lock de-icer. Even cleaning supplies. It’s super tough, too, so feel free to be rough with the high-impact, ABS plastic. It’s just a simple and brilliant way to keep your tools and other valuables safe, organized, and out of the weather. With just four simple mods, we’ve turned your truck bed into a luxury apartment better than any you could rent in Monaco for that price. Wait…sorry. Somehow we keep forgetting you’re not planning to live in there, even though it’s nice enough now to do just that. Or transport a soccer team, because that’s illegal and potentially dangerous. What we’ve really done is gained you a whole lot of utility, functionality, and style, all with stuff you can easily install yourself. Remember to give us a call at 877.787.8989 or drop a note in the comments if you have any questions about the right Chevy truck bed accessories for your specific truck, and stay tuned next week as we tackle the Silverado’s interior. Happy modding. What mods have you done to your truck bed?